In my last post, I asked my readers to guess where I would be going next on my KK trip. And the hints I gave were a box of anti mosquito patch, a packet of Hansaplast, a Carman's energy foodbar, a Cadbury chocolate bar, a box of Dentyne chewing gum and a binocular. OK, let me reveal where I would be going on my third day in KK. I bought the Hansaplast because I injured my finger at home on the day I was leaving for KK. I needed it to protect my finger. Now the Dentyne chewing gum was just for my chewing pleasure during long journeys! It is definitely not essential for this trip. 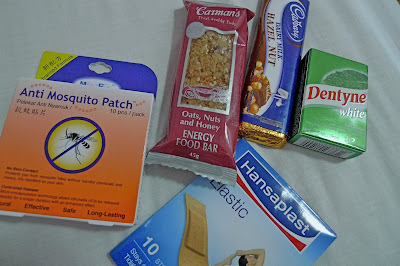 So the only essential items were the anti mosquito patch and the binocular. Where in KK would I need these two items? Well, it was for a trip to the Klias Wetland to watch the famous Proboscis monkeys! I actually booked this Klias Wetland Cruise tour through the people at Lavender Lodge where I stayed. For RM185, the tour include a cruise along the Klias River and a buffet dinner. The pick up van arrived at about 1.30pm in front of Lavender Lodge and then proceeded to pick up 2 female tourists from France and a couple with a kid from Australia at separate hotels. Heading towards Beaufort, the journey took around 2 hours through beautiful countryside scenery of padi fields, sago trees and palm oil trees. There was even a Chinese temple halfway but we did not stop by to take any photos. Our tour guide who was also the driver, provided us some entertainment with his interesting comments about the sago trees and padi fields. 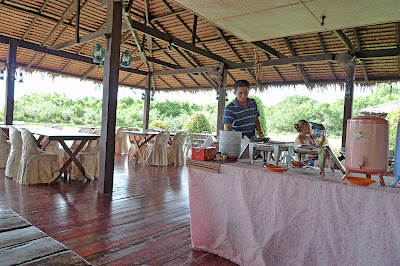 We arrived at Kampong Garama near the Klias Wetlands about 3.30pm. 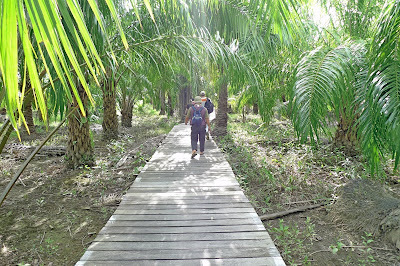 Walked along this wooden planks past oil palm trees to our destination for our tea break! This is the place where we had our tea break. 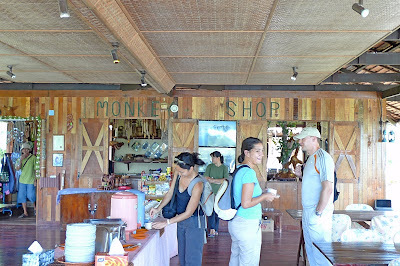 Do you see the word 'Monkey Shop' on the wall? The shop sells souvenirs though I didn't buy any as I thought the items were pretty pricey since they were aimed at tourists. 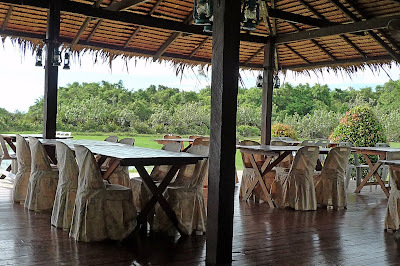 The place had quite a nice ambience to it and I thought it was kind or relaxing to have a meal there by the wetland. I guess it was time to tuck in some food. I had a very light meal. 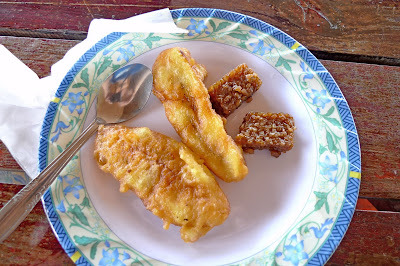 Just some banana fritters and kueh. After the light tea break, we were all ready for the river cruise. We had to put on our safety jackets and followed our tour guide onto the boat. It was already past 4pm by then, which according to our tour guide, was the right time as the proboscis monkeys only come out then. Unfortunately, I could not take any good photos of the monkeys as they were too far up on the trees for my camera to zoom on. This is the only photo which I think is the best as the rest were all disappointing! 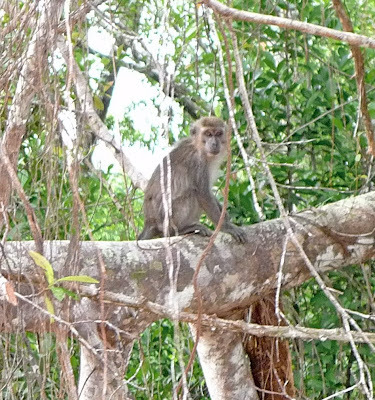 I had a closer shot at this one, but it's just a silver leaf monkey, not the proboscis monkey! 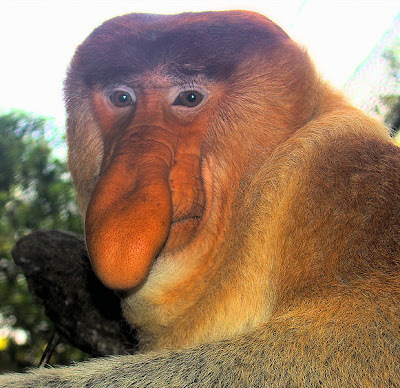 Now this is how a proboscis monkey looks like. This picture is taken from Wikipedia. Notice the characteristic long nose? That's why the monkeys are also known as long-nosed monkeys. Some people call it Dutchman monkeys. Know why? Cos besides long noses, they have pot bellies too. Just like the Dutchmen. Haha! The males appear to have longer noses than the females. According to our tour guide, the long noses are used to attract the females and also act as a resonating chamber to amplify their "honking" calls. 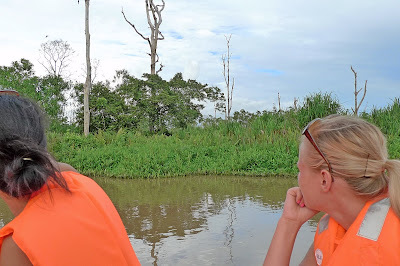 During the cruise, our tour guide imitated those "honking" calls to attract the monkeys to show themselves. It was a good thing I brought along my binocular. I could see the monkeys very clearly but too bad, could not take any decent photos of them! Oh, by the way, we also had a close encounter with a crocodile. Yes, a crocodile! I did not manage to take any photos of the crocodile as it did not show itself fully but remained submerged halfway in the water. The crocodile floated in the river near our boat, then disappeared into the water. The situation was a little tense as we were wondering when it would come out of the water again. Look! The girls appeared to be a little nervous waiting for the crocodile to reappear. One of them jokingly asked what would happen if the crocodile decide to attack them and flip the boat upside down? Reminded me of Australian crocodile movies Rogue and Black Water! However, our tour guide quickly reassured us that in the history of Klias Wetland, there have never been a case of crocodile attacks before. Well, didn't he know that there's always a first time for everything? Haha! After about an hour and a half cruising the river, it was time to head back to the restaurant for our buffet dinner. On the way back, the sunset provided a beautiful opportunity to take some photos. I do not know why or how but I somehow lost all those sunset photos! What a pity! There was only one shot I have, with the girls in the picture. After our buffet dinner, which was really nothing much to shout about, I quickly applied the mosquito patch onto my clothes. It was time to return to the river for a night cruise to see the fireflies! However, on this second cruise, we were told not to wear the life jacket as it was just a short cruise. I thought it was not a very good idea and I think the organisers should re-think this. They are putting their customers' lives at risk. Don't forget it is night time and it is all dark. If someone falls into the river, it would be quite hard to see where he or she is! Anyway, the fireflies tour was a disappointment. There were not many fireflies around! We could see some trees lighted up in the dark, but that's about it. I had expected more. However, one firefly flew onto our boat. We captured it with our hands and after passing it from one person to the next, we let it flew off to the trees. With the river cruise tour concluded, we headed back to the van for a 2 hour drive back to KK. I would say, I quite enjoyed myself and I would recommend it for first timers. But no second time for me. If you were to go on this tour, remember to bring along a binocular. Otherwise, you would be disappointed because the proboscis monkeys would be too far away for you to see properly with the naked eye. Unless you don't mind renting their binoculars of course. 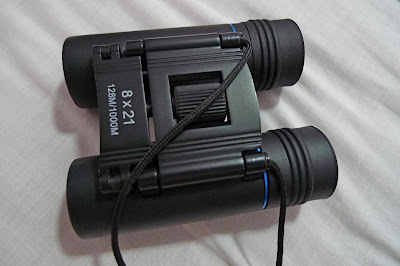 I think it's RM5 per binocular, if not mistaken. Also, remember to apply mosquito repellant or mosquito patch if you do not fancy being bitten by the mosquitoes at night. The monkeys are a rare sight aren't they? Ugly nose, orangy body and grey arms. :( Missed FC again Foong! Happy Monday, enjoy going back to work he hehe! I guess next time you should go to Sandakan orangutan sanctuary. That's a good nature encounter. Did you take any photos with the pretty girls? hehe. That's a lot of monkeys up in the big tree. mei teng, yes they are indeed! 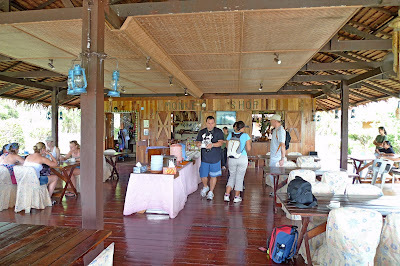 Did you go to Labuk Bay and capture any photos of proboscis monkeys? I hope you did! khengsiong, yes, will do that! I almost wanted to go there but did not have enough time. It would take me one whole day just to fly to Sandakan from KK, visit the orangutans, and then fly back. levian, yes very unique creatures with long noses and big bellies! I hope they would be protected and not be endangered by humans. nope, i was fooled by long scrolling! I'm still reading the last part...had to pause since i first commented here. with your chocolate treat, some people gets the sugar rush and some have calming effect on them. just like you! The crocodile encounter could've been better if he jumped into your boat! Just kidding! ayie, ok good thing you said you were fooled by the long scrolling otherwise I thought maybe you were reading the wrong blog! Haha! Now I know if I can't sleep in future (which will be a very rare occurence) just chuck in a bar of chocolates! Haha! Wow! So evil you! Want the crocodile to eat us? But that would be the adventure of a lifetime! Maybe I would be known as Malaysian Crocodile Dundee after that! LOL! Hehehe, was that so evil? I'm off now...I'm getting a little sleepy. nytie! or should I say good morning there? Glad I am not a full blooded dutch woman hihihi oh and no I am not gonna sue. Didn't know they were know for big long noses?! ....looks like a great place. Maybe I'll visit it someday. Btw, I was in Malaysia too but only at the nearby Desaru...will talk about it this week. A really nice experience, eh? Later you can compare this trip of yours to Sabah...and the one you will make to China soon! cruise in a river of crocs? O_O what if they really choose to attack??? jade, thanks for not suing me. Haha! You were in Malaysia? Oh, will look forward to reading your post! Just visited your blog and now I think I'm clearer. In any case, I think you are a rojak! LOL! TZ, you eat Carman's foodbar too? Looks like we both have something in common, yes? I think it's one of the more healthier foodbar with lower sugar content. Just the bar for you since you don't want to put on weight! LOL! Regarding the difference between proboscis monkey and other monkeys is that the former has a very long nose and a huge pot belly. Interesting trip! So I was right about the watching part lolol!!! The website at foongpc.blogspot.com contains elements from the site www.serradinho.com, which appears to host malware – software that can hurt your computer or otherwise operate without your consent. Just visiting a site that contains malware can infect your computer. For detailed information about the problems with these elements, visit the Google Safe Browsing diagnostic page for www.serradinho.com. I understand that visiting this site may harm my computer." Nice pictures, Foong, including the faraway shot of the monkeys and the sunset. Too bad you couldn't see them closeup. Am impressed with the restaurant's neat appearance. Looks clean too. I remember on my blog you asked about the orangutan sanctuary. There is also one in Kuching. That's the one I went to. I need to go back to my photos to see its name. I suppose wearing the life-jacket with the luminous strips might scare off the fireflies. I read that the one at Kuala Selangor is also having less fireflies now - the result of forest clearing in the name of development. So sad. These kinds of places should be preserved - at least for tourism. eh i thought when you asked "guess where im going next" i thought its another trip! lol.. but its the next day of your KK trip.. haha..
Wow! You are a survivor. Great mind think alike. Those are pretty cheap lifejacket. I can see it is made from China. Seen a lot of those from my work. What a cool trip you had. I'm jealous :P I've never seen a proboscis monkey in its natural habitat b4. I certainly will not go there because I'm known to be an attraction to mosquitoes! happysurfer, thanks! 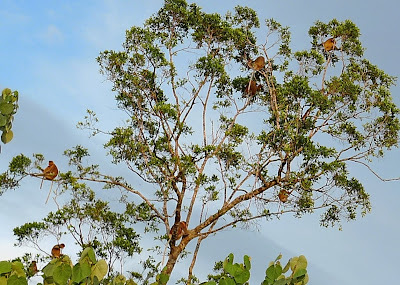 I used binoculars to watch those proboscis monkeys but could not take good photos using my digital camera. Oh, there's also an orangutan sanctuary in Kuching? Didn't know that! So that's probably why we are asked not to wear the life jacket! Yes, even Kuala Selangor's fireflies population is dropping. Too bad humans don't care about the environment and just want to keep developing and make money! anton, it's OK. The journey on the way there was quite nice with nice views of padi field and sago trees and we were entertained by the tour guide. Only the journey back a bit tiring cos it's at night and could not see anything! Kuala Selangor is definitely a better place to catch fireflies, but I went to Klias Wetland to see the proboscis monkeys, not the fireflies. So it's OK really. acura, you are right! The Dutchmen do have long noses, besides pot bellies, that's why the monkeys are named after them! The Man U goalkeeper is a proboscis? Haha! borneo falcon, me? A survivor? No lah! Haha! Those lifejacket may be cheap, but it is still important to wear them. Cheap lifejacket is better than no lifejacket! this is amazing and I have never seen such a monkey nose before. life ramblings, I guess not many Malaysians know about this monkey! Hey, the proboscis monkeys look so weird. neo, yes it is effective. Just peel off the patch from the given pad then stick the patch onto your clothes. Like your socks, inner part of your trousers and shirt. I had never heard of these monkeys!!! You are so lucky to see such things. Watch out for mosquitos. Ahh the sunset pict is wonderful... because there are 2 lengluis in the pict. Oh so that's where you went. Beaufort is quite far right? Hahaha...the banana looked....so..."tak cukup makan"! War...you encountered those heavy-nosed monkeys? Gewd for you bro. All this I have only "meet" them through the tubes...a~lar National Geographic lar! Looks like a lot of backpackers there too huh! And...ouh...yeah...before I leave...did you bump into Mei Ting? ha :D she was in Borneo too. Hmm...are both of you dating...secretly by going there? Something fishy is going on at Borneo! I can smell it! Hmm...I'm hyperactive huh this time around...leave so many comments. :D Anyway you have a great trip ya. che-cheh, haha! Beaufort is a 2 hours drive from KK. tekkaus, the banana "tak cukup makan"? haha! That's a funny remark! Yes, a lot of backpackers, mainly from foreign countries. I also don't know what happened. A fellow Entrecard's blog was attacked and I don't know how is that connected to me. Maybe I've a link there? Do you still see that warning message when you visit my blog this time? Haha! Nothing fishy happened in Borneo, OK? I visited KK and Mei Teng visited Sandakan - two different places. Also, when she went I already came back! Didn't bump into Mei Teng, but bumped into "Nicole Kidman". LOL! Mei Teng - for giving a History lesson to clarify. - end of class. LOL! Hey Foongpc! I've been on the cruise too and it was pretty fun, although it was raining tho at that time. Foong, there is another easier the place to shoot the proboscis monkey at Lok Kawi Zoo located along Penampang - Papar road. They are in captive but the downside is miss the sense of adventure. aiyahhhh.... I thought you could take a picture of the proboscis monkeys. Didn't the boat go nearer? I came here through Jade's blog. Found it to be absolutely interesting! I don't wanna miss it so I linked it to my site. I hope you can do the same. happysurfer, haha! The way you said it made me laugh! I giving Geography lesson? I think I'm quite poor in Geography! Haha! rozella, raining? Now that's not so fun! Did you see the fireflies later in the night? Regarding the anti mosquito patch, you just stick them onto your clothes, not your skin. As long as you spread them around, you will cover most areas. If you place the patch on your sleeve, the mosquito will avoid your arms. Place one patch on your collar and you will avoid mosquito bites on your neck area. eastcoastlife, the boat went as near as possible - could not go any nearer. That's why we need to bring along binoculars to watch the monkeys. No worries about the mosquitoes cos you can always wear anti mosquito patch or apply mosquito repellant. I didn't get a single mosquito bite during the cruise! If you have not experienced cruise along a river filled with crocodiles, this can be fun! OK, I'm just kidding about the crocodile part, though there were crocodiles but not a lot. I did not take pictures of fireflies because it was a rather disappointing turn out of the fireflies. I think the population is dwindling. Ha Ha, the nose damm big lorr! I am the owner of Serradinho and my site was hacked but it is back in order and there is no malware anymore. and it is thought of as the original watch for airline pilots. It was one of the first chronograph watches with a circular slide rule on the bezel. craftsman that the 12 hour numerical dial be changed to a 24 hour dial.